Beyond the Cave: Where are the holograms? It was the summer of 1993 and I couldn't stop playing Time Traveler. The game was an oasis of fun at a boring and shady strip-mall on Long Island, New York. In a dark and empty hallway near the Marshalls where my mom shopped, Time Traveler was the most incredible arcade game I have ever played. The plot was generic, but the experience was extraordinary - a real, 3D cowboy fighting bad-guys throughout history (and the future). 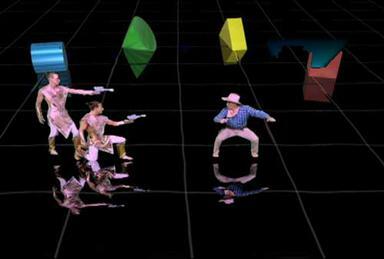 Time Traveler is considered to be the first holographic arcade game. It was released in the early 1990's and there hasn't really been anything like it since - the economics of making it just didn't make sense at the time. I would play and my dad would watch. One day, when we went back to the mall, the game was gone and I was sad. Like a mirage, the game appeared and disappeared within one formative year in my life. Ever since, I've been waiting for a game or a TV show or a movie or a smartphone to recreate the experience I had with Time Traveler. That game was awesomely different at the time.